Panthers owner Ged Rathbone is involved in another Speedway Control Bureau investigation. 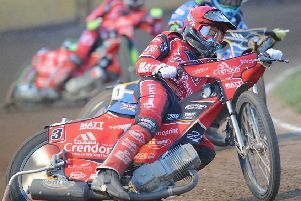 The SCB recently hit Rathbone with a heavy fine after he accepted a financial payment from Polish club Torun to release number one rider Jack Holder during the summer. He has also been ordered to offer free admission to Panthers’ first league fixture of 2018 if the club survives. Now, the governing body are looking into his recent comments when he revealed he acted on the advice of British Speedway Promoters’ Association (BSPA) vice-chairman Rob Godfrey. An SCB statement confirmed: “Following the Speedway Control Bureau court hearing into Peterborough promoter Ged Rathbone’s conduct in relation to releasing a contracted rider against both the SCB and ISLB regulations and agreement, Mr Rathbone made a public statement after a meeting at Peterborough - a statement which was repeated in the Speedway Star magazine, dated October 21. “Mr Rathbone’s statement contained serious allegations which were of sufficient importance and concern to warrant further investigation. “The SCB members sought the guidance of the ACU and were advised to set up an independent judicial review panel to enquire into the allegations. The Peterborough Telegraph understands that Tuesday (November 7) is the date the matter will be dealt with.